The first John Worrall was born about 1858. He and his wife Mary, settled in Willenhall, Staffordshire, in the 1780s. Maybe he was already a master locksmith and wanted to have his own business, and pass on his skills to his sons. 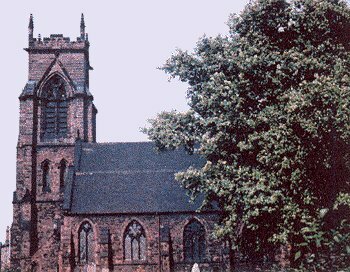 They had three children, William, John and Elizabeth, who were baptised in St. Giles’ Church, Willenhall. They are the second generation of Worralls, but it is the descendants of their second child, John, from whom there are many, that I have recorded here. John was born on the 8th October, 1878. The first John Worrall was a locksmith by trade and, like many in the Willenhall area, he made locks in a building at the back of his house. St. Giles' Church, Willenhall. He is listed in the 1833 Bridgen's Directory as a Locksmith of New Square. New Square could have been part of a new development in the early part of the nineteenth century. At a very early age, maybe ten, young John would have been taught by his father how to make locks, so that he could become a master locksmith and follow in his footsteps. 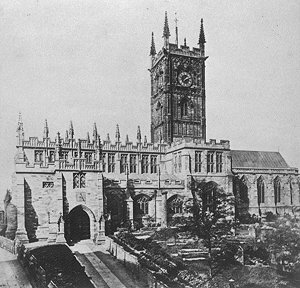 On the 5th April 1821, at the age of 21, John Worrall married Mary Taylor in St. Peter's Collegiate Church, Wolverhampton. At that time St. Peter’s was the only church which had licence to marry. Records of Baptisms which took place at St. Giles’ Church, Willenhall had to be passed on to St. Peter's, Wolverhampton, as it was the main Church, and they were recorded again in St. Peter's records as though the children were baptised there. John and Mary's children are the third generation. In my research I have found only their four sons, but because of the wide range in their ages there could have been more children. The eldest son, Daniel is our ancestor. His brothers were Thomas, David and John. Daniel was baptised on the 28th March 1813, and Thomas on the 19th December 1818 in St. Giles’ Church. David and John were both born in Willenhall: David about 1821 and John about 1829. John Worrall senior died in April 1834, at the age of 78. The same year he was listed in White's Directory for 1834 as a Rim Lock maker. His son, John, carried on trading along with his son, Daniel, who was by then a qualified locksmith, and sons Thomas and David who would have, at that time, been learning the trade. 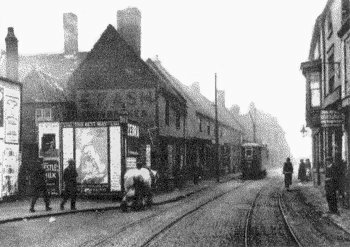 Walsall Street, Willenhall in the 1930s. After the death of his father, John and his family moved to Walsall Street, where they continued to make Rim Locks. In 1841 when John and Mary were in their fifties, they were living in King Street, Willenhall, along with three of their sons, Thomas, David and John. They were still manufacturing locks, and they employed four apprentices aged between 10 and 14 years and a labourer. When their eldest son, Daniel married Helen Meanley, who had been born in Bromley, Middlesex, about 1807, he was working in the family business, and so they began their life in Willenhall. Daniel and Helen's children are the fourth generation.